This is my first blog post, and have no real expectations other than just journalizing my experience. 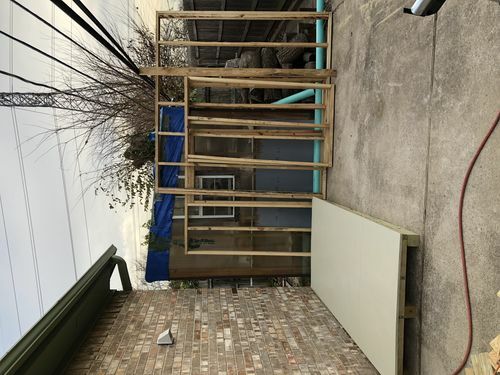 For this series I will be discussing my build of a small shed that will eventually house my dust collection and my air compressor. After discussing the project with my wife, it expanded to a 4’ by 8’ catch all shed. Aside from the dust collection and air compressor I haven’t really thought about the interior. I just want to build the thing. As this point I have it mostly built. Four walls, a roof, and a skid-style floor. At this point the frame is built, the roof shingled, and the exterior walls are sheeted with OSB and wrapped in Tyvek. The first objective of this project was to utilize as much reclaimed lumber as possible. I came across some 2X4s that housed signage from a local construction project. After denailing, the pieces became the frame for the walls. An old fence will become siding shingles (at least in theory). The floor, OSB, and roof are all purchased. Since I am working in a confined space I actually framed the walls first. Typical 16” on center with code-correct door framing. 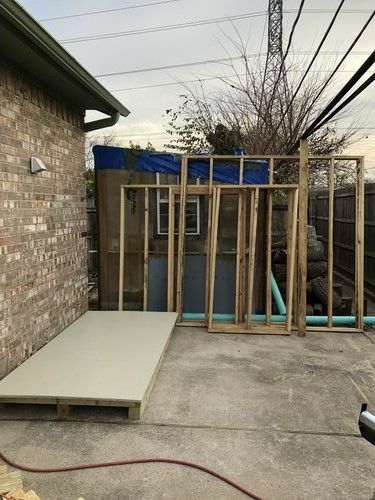 Once the walls were constructed and put aside, I built the base for the shed. I used pressure treated 4X4 for skids. with pressure treated 2X4 for the floor joists. This was topped of with 3/4” exterior plywood with the bottom side painted with exterior latex paint (one gallon for $7 in the scrap bin). With the base completed I used 1/4” X 3” inch lags to attach the frame to the floor. Rafters were cut at a common angle of 4 (thanks YouTube for teaching me how to cut rafters) and spaced at an over-kill of 16” on center. The door skeleton was built with 2X4s and mortise & tenon joints (more over-kill) and attached to the OSB from the inside. I clad the walls and roof with 7/16 OSB. With more help from YouTube, I managed to shingle the roof with left-over shingles from an earlier house repair. Wrapping the shed in Tyvek (probably more over-kill) proved to be a challenge. I bought a 36” roll (cheaper) and made several passes. However, at the time I was doing this, a cold front moved in. One very important lesson was learned. Tyvek tape is VERY sticky and will adhere to anything. One should NOT use one’s teeth to cut Tyvek tape during a wind storm. Just saying. With a clear day (and another storm coming in tonight), I am going to try to hang hinges and cut the door today. Lets see how it goes. ... I came across some 2X4s that housed signage from a local construction project. After denailing, the pieces became the frame for the walls…. j/k, good use of reclaimed materials. LOL – actually, I was working as a sub on the site. I saw the sign guys ready to trash the wood and I was like: “hold on there a minute”. They loved that I cleaned up the wood for them, one less thing they had to do. Thanks House the picture tells us a lot, like is it on a slab which helps a lot in your build. Not sure how you managed to turn the picture correctly. A PM or link to a description on how, would be much appreciated. I am building on a slab, though it is on a all-so-slight gradient. The air-vent protruding from the bring wall was removed and opened enough to accept a 4” pipe (for the dust-collection), a air compressor pipe, and power. I would love to get my dust collector outside of my shop to free up some space and make things a little more quiet. It’s on the (long) list of things to do. A couple of things you might want to consider, especially if the shed is attached to a living area, or if the shop is in a heated garage. If you don’t plan on returning the exhausted air from the dust collector back into your shop, you will be removing a ton of heat from the room in a hurry. Even worse, it will create a negative pressure in the space and can pull exhaust gasses from the furnace/water heater back into the living areas increasing the risk of carbon monoxide exposure. Maybe you’ve planned for this, or it doesn’t apply to you. But just in case…..
A couple of things you might want to consider, especially if the shed is attached to a living area, or if the shop is in a heated garage. If you don t plan on returning the exhausted air from the dust collector back into your shop, you will be removing a ton of heat from the room in a hurry. Even worse, it will create a negative pressure in the space and can pull exhaust gasses from the furnace/water heater back into the living areas increasing the risk of carbon monoxide exposure. Honestly, I have not thought about it. I have a detached garage that I use as my shop. It does central heat and air. I planned using blast doors and pipe the exhaust outside. I will be using a remote to kick the system on and off when in use. As my wife has commandeered the shed for now, it is a non-issue.